Property Size 1,150 sq. ft.
You will be thrilled to come back to this unit after a long day at the beach to cook and relax with the entire family. This unit offers a very large kitchen with dining space for six. In the living room there is a day bed and two couches with comfortable space for everyone. This well appointed unit has a half bath downstairs and two bathrooms upstairs. The master bedroom has a queen bed with a bathroom and shower in the room with an A/C unit. The second bedroom upstairs has two twins, an A/C and a full bathroom with a tub in the hallway. 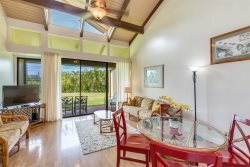 This well decorated, family condo has a lanai overlooking the Fazio golf course at Turtle Bay Resort. It is well decorated and you can feel the family vibes throughout. Within walking distance you can choose between two world class golf courses at Turtle Bay Resort, fine dining restaurants, amazing beaches, surfing, horseback riding, and a beautiful spa. No smoking/no pets allowed. Unit is NOT ADA compliant.